A year ago, I was in the worst shape of my life. At 5’3” I was a bit over 200 lbs. I had back pain, knee pain, and occasionally got migraines. My allergies were terrible, I was always tired and felt as though I was living life in a fog. I’ve never been athletic, but always felt I was still strong… but even my strength was fading. I don’t “do” gyms; I’ve occasionally gone on the elliptical or treadmill at the gym in my town but never consistently. The last time I consistently went to a gym was college and that was only for one semester. 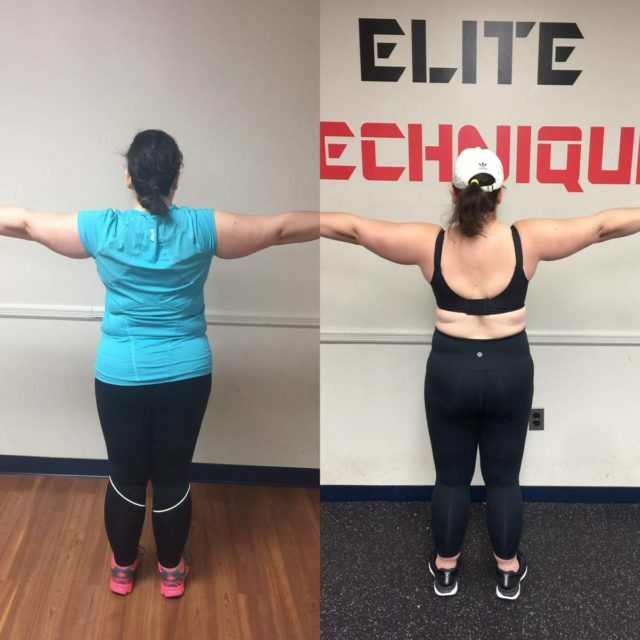 Yet for some reason I connected with Elite Technique, a gym in Beltsville, Maryland and signed up for weekday personal training sessions. I’m famous for giving up when things get tough, but I stuck with the gym. Over an entire year, excluding vacations and business trips, I have only missed eight training sessions. Every weekday morning, I go to Elite Technique and work with my trainer Khalil for a half hour. Often, the session starts with 10 minutes on the treadmill, then we do weight training. When I joined the gym, I didn’t have big dreams about getting thin. I just wanted to get back under 200 lbs and I wanted to be strong again. I achieved my goals in this past year and with it, learned so much about myself and what defines health. 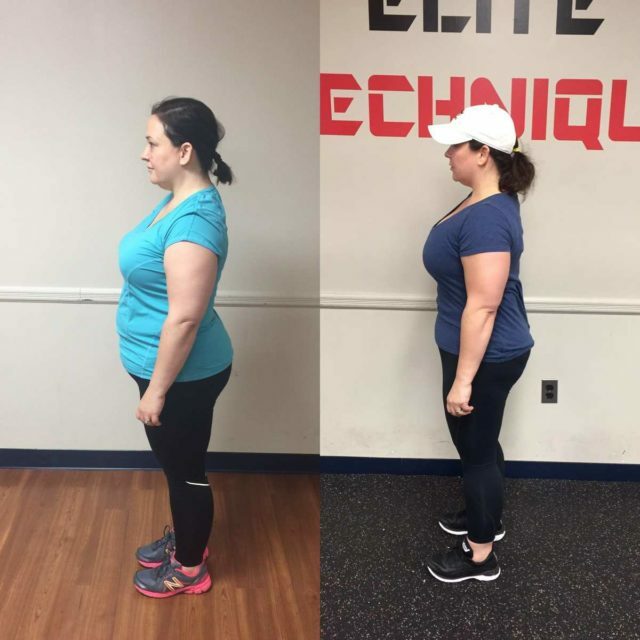 When I joined Elite Technique, I was a size 16 with a 38F chest. Now, I am a size 12 with a 36DDD chest. I haven’t had a migraine since I started working out. My cholesterol and blood pressure both dropped into a nice comfortable, healthy range. No more back pain, hardly any knee pain. My skin looks better, my posture is better, and my body is a completely different shape. 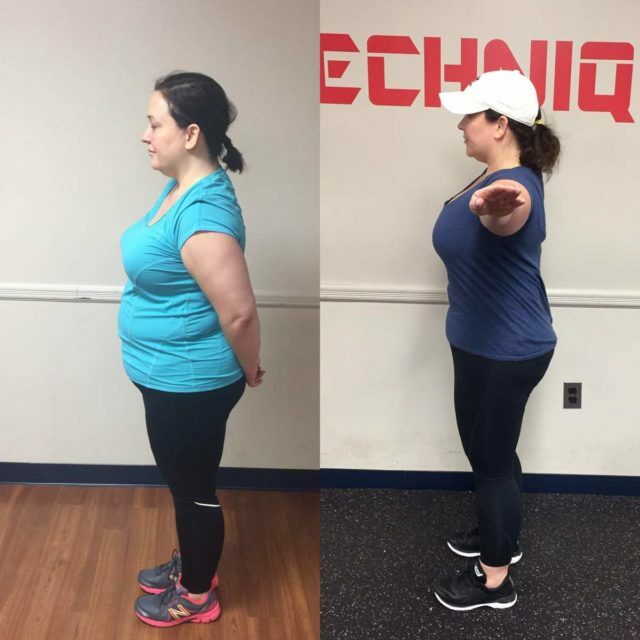 I mentioned in this post, but with all these changes I’ve only lost 10 lbs. But these photos show that weight is not the only factor in determining health, shape, or strength. And at age 43, I show that it’s not too late to start. In fact, my mom is 75 and she just started working out at Elite Technique this year. She recently had surgery and the doctor said she likely healed so well and got through the procedure so beautifully in part because of her weight training routine. Society may make us feel bad for its size, shape, or ability but our bodies, all of our bodies, are awesome. Our body is the only reason we are here, and deserves to be nurtured and respected. 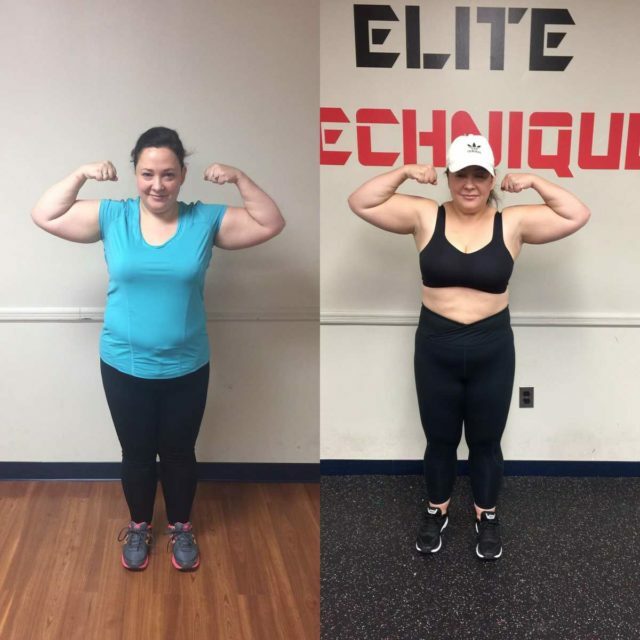 Weight training helped me reconnect with my body and improve my relationship with my self. It has helped me fight past that bad influence on my shoulder that encourages me to hit the snooze button, has retrained my mind to crave different things when I am sad, mad, or frustrated. It helped me find routine and time for myself as a work from home entrepreneur who could spend all day in her pajamas in front of a computer. It made me an inspiration for my daughter, reduced the number of days I was sick or out of commission, and made me a more equal partner with my husband when we went camping, kayaking, biking, and completing home improvement projects. Here’s to one year of fitness, I cannot wait to see what I can achieve in 2019! I know some of you are curious about what I am wearing. I stopped trying to make my hair work at the gym so I wear baseball caps; they also keep sweat out of my eye. The sports bra is the Catalyst from Knix. The leggings are Core10, you can design your own for a good price and they've held up beautifully. They're my favorite leggings; Zella is a close second. The navy shirt is from Daily Ritual, the turquoise one is Zella, but my favorite workout top is from Universal Standard. My favorite workout underwear, as well as everyday underwear is the boyshorts from Knix. My favorite socks for working out are SmartWool Hide and Seek (they keep the sweat and funk at bay and last for years). My current favorite sneakers are these from Asics which give a lot of arch support and stability. For those who live in the area, Elite Technique offered me a promo code for Wardrobe Oxygen readers: sign up with Elite Technique by December 25, 2018 with promo code OXYGEN20 and get 20% off your first package. Discount for new clients only, promo valid until the 25th or when their schedule fills up. If you have any questions about Elite Technique or their trainers let me know in the comments. I am not paid by Elite Technique and pay for my sessions just like everyone and will provide honest answers. So impressed Allie – you look fantastic. Thanks for disclosing that you lost a relatively small amount of weight – interesting to know given you look like you’ve lost much more than that and might encourage people (me!) who get disappointed when the scales stay the same with exercise – it is CLEARLY achieving something for you physically. And I love that you have taken the time for this self-care and how it is paying off in how you feel. As always you continue to amaze and inspire me!! Just wondering if, in addition to working out five days a week (!!) you made any changes to your diet? I just joined a fancy new gym and I’m thinking that the amenities will really get me going there much more often. Congratulations Alison! Being strong and healthy really is the goal, and you have set a fantastic example for your family and your readers. Life is so much better when we move. And I agree —it’s not about the number on the scale. Congratulations Alison on the changes you have made in your health and well being. A whole year of commitment and consistency looks good on you!!! Yes, you did it for yourself, but your mother, husband, daughter and your job benefited as well. Sometimes we think going to the gym, walking, jogging, skating, skiing, or biking is selfish but it’s good for everyone you are connected to. I look forward to hearing your achievements with your trainers and reaching new goals all during 2019. Allison!!! Thank you for sharing this year’s journey with fitness. You look so healthy and so beautiful. I love reading your letters and blog and hope you continue to be successful in the coming years. The amazing thing with taking care of oneself is that it gives one so much energy to take care of those we love and in the same swoop it provides an example for others to follow. I think many folks are much too focused on weight. There are so many factors that play into health and fitness. The first time I went to a gym, the trainer told me to forget about the weight and use the tape measure to gauge my progress. I would not be surprised if Allie gained weight while she continues to work out. Muscle is dense, heavy, but takes up less space than fat does. At this point, I think Allie is seriously muscled and will continue to reduce body fat percentage. with all the machines and free weights to pick from. Thanks Allie for encouraging us all to get or continue on track! You look AMAZING! Congrats on all your hard work paying off! Your enthusiasm and energy are inspiring. Can you share how much your gym and personal training cost? I live in a high cost of living area without a car and am finding the price of gyms daunting. Thanks. It costs $400/month for five sessions per week. They offer 2x/week and 3x/week packages as well. In case you (or other readers) haven’t seen this website, I ran into the other day and it think it is an interesting project idea, though the photos are fairly low resolution and it certainly does not cover the full diversity of body types or weight for heights. This is a fantastic resource, thank you Maia! WOW! good for you for your commitment to yourself…you look great, but more important, as you state, you feel great. You inspired me to start working out in February. Your instagram stories really helped me along. I was having terrible lower back pain and lost a lot of strength after getting a job in another town 3 years ago. Driving instead of cycling and transit gave me pain and weakness. So I joined a workout group, and with that and your persistence and consistency helped me feel like I could be badass too! In September, I slipped on a hill while walking my dog and injured my foot. I can’t do leg-day like I could before, so I’m concentrating on core, arms, shoulders, and back. Here now all these months later, I want to thank you for your inspiration. Ally works out so often! I can do it too! I feel SO MUCH BETTER. You look great Allie. Kudos to you. But I have got to say….190 lbs and a SIZE 12? That hardly seems possible. I am 5’3” tall. 190lbs. Average frame. 36B. Walk on the treadmill 3-4 times a week. I am not even close to a size 12 and except for my chest, my body shape looks pretty close to yours, by your pic. Really? A size 12? I did not imply you were lying. I simply stated that 190lbs, no matter what the muscle mass, is typically not a size 12. I was 170 lbs two summers ago, and I was in a size 16. I still find it unusual. Take care. If I came off sensitive, it’s because you’re not the first, or second or even tenth person so question my weight to size. Each time I share a photo of me in a swimsuit or cocktail dress, or mention my weight I get emails, DMs, comments, and threads on message boards questioning if I was being accurate and often sharing what size or weight they really think I am. The way you worded your comment came across in a way that seemed like you felt I wasn’t accurate and I got defensive. I’m sorry if I misinterpreted your message and I thank you for being part of the conversation and coming back to explain. All of our bodies are different, and even though you two are similar in height, if she’s working out with weights and you are doing cardio, she is going to be a smaller size at the same weight. 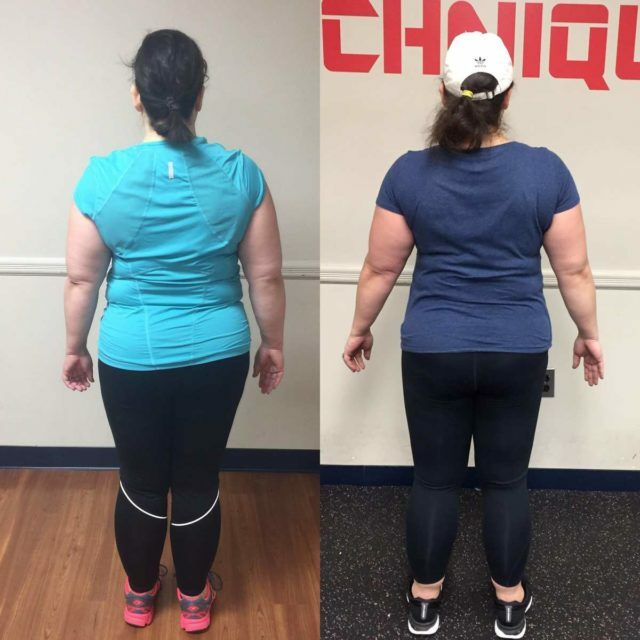 If it seems unusual to you, check out Pinterest for photos of women who gain weight while weightlifting and still look dramatically smaller than their before photos. I’ve been lifting weights for over 25 years and so I don’t find this unusual at all. After giving birth to my son I weighed my all time high of 284, and wore a size 20. Now at 190 pounds I wear a size 8/10 or a medium lifting 2-4 times a week for 20-30 minutes, walk as part of my work with kids, and doing gentle yoga for 20 minutes daily. 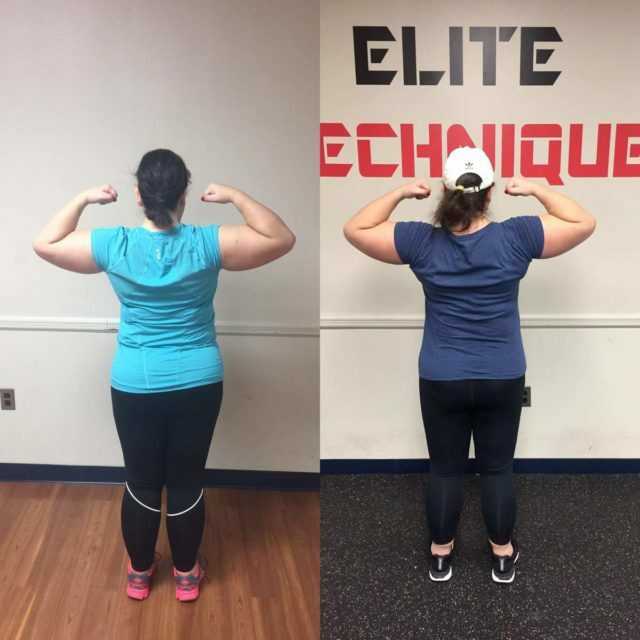 If you aren’t happy with your results, perhaps Allie’s results might inspire you to explore other fitness routines. You are amazing and inspiring. Thanks for showing those before-and-after photos; they really show off your hard work! OK, great! Now I have to renew my commitment to fitness. (heh heh) Like you, I am notorious for quitting when the going gets tough, but you’ve inspired me. And it will start with a new bra for the girls! Yay (they say)! Great job! You are such an inspiration to me in so many ways. Thank you for sharing your success with us! You look amazing, thank you for putting yourself out there. It’s very inspiring. Congrats on 1 year in. That’s a lot of commitment and it shows. You look fabulous, and better than that you feel fabulous. So inspired and proud of you Ali! Congratulations on your hard work! You have inspired me and lots of others to recommit to fitness this past year–so thank you for your example and your willingness to share the process with all of us. The payoff in terms of mood, strength, health improvements and pride in yourself will continue to reap benefits–so glad to hear that your migraines have dissipated. They are the worst! I love how you’ve demonstrated that once it is part of your day, it just becomes a lifestyle. Thanks! Good work rewarded! I know it’s physically hard and sometimes emotionally you just don’t want to do it, but I find a workout is the best way for me to get my head into a better place. I have been messing with foot injuries (that are uncureable/untreatable) and have had to adjust to the fact I will no longer be able to do long-distance running/walking again. But I started yoga this year, got more serious about short distances (5Ks), and weight training. I have no idea my starting weight or my current weight, but recently during a closet cull, I sent 12 pairs of pants and some skirts to the charity bin as they are too big. And a down puffer coat I was going to consign as it was kind of tight is now perfect. I also overhauled my eating. My body has changed, proving that even at the elderly age of 63, all things are possible. I’ve always been a person who enjoyed working out, but this year, I got way more serious as Ihad more time and decided to get back on track. You are an inspiration for many. Good work. So happy for you! You look SO much healthier/happier. Congrats for sticking with it for an entire year. 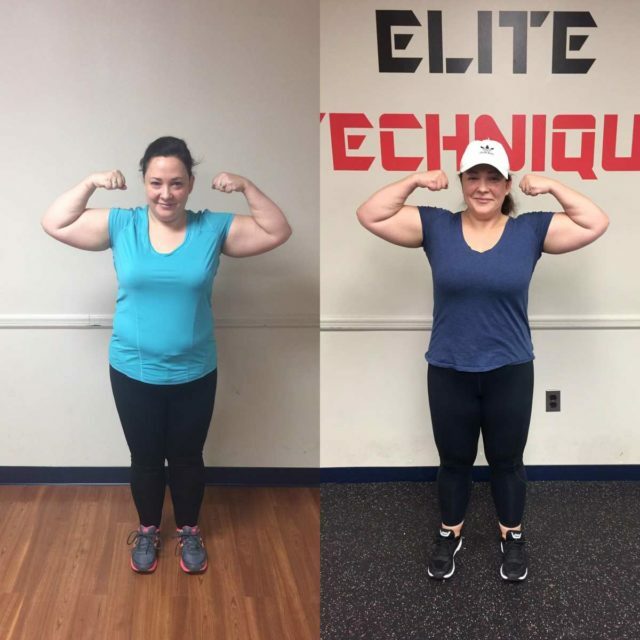 You actually inspired me to join a gym and I’ve been consistently going every other day for the past month and a half – I hope to keep that up in 2019! You go, girl! I also love weight training. I have just started working out 5 days a week. If you don’t mind sharing, is there a specific order that you work your muscle groups in? Usually Monday is leg day, then we switch it up one day back, one arm, one chest. Then Friday is a mixed bag; sometimes we do cardio, sometimes agility, sometimes we revisit a part of the body. Get it girl! You are another example of how being fit and healthy does not have to mean a size 2 with six pack abs. You look great. Not because you’ve lost some inches or toned up. You have a healthy glow about you that says “I’ll snap your skinny arm like a twig if you mess with me”. You are a strong, beautiful example for all of us! I don’t know why but I was wondering about your results with your work out. I am really excited to see the inches you have lost. I too am not athletic and gym is a dirty word. But gosh the results, tenacity determination you have displayed is so so encouraging. Thank you for continuing to post your after work out posts. 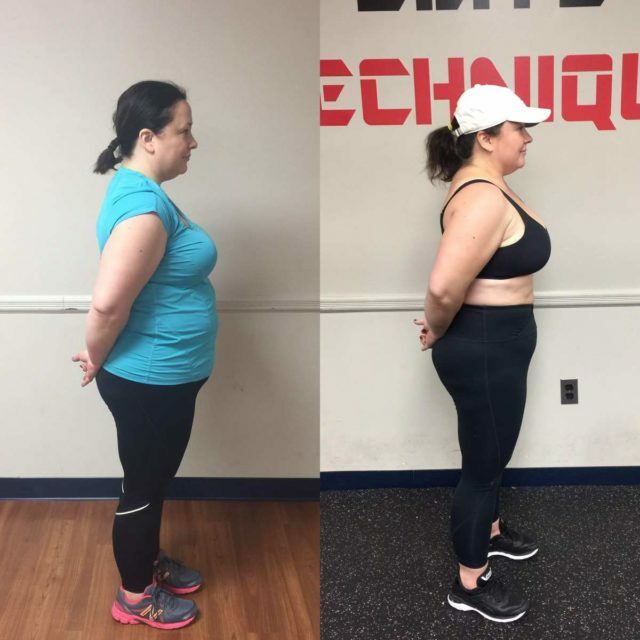 In July I signed up for personal training sessions, because of your posts. I haven’t missed a session since. I could tell how good they made you feel. Like you, I don’t have illusions of being a swimsuit model at my age of 43. I just don’t care about that. But I adore my new firm muscles, even if they are hiding under my wobbly upper arm flesh. It’s just so satisfying and my trainer pushes me farther than I would have ever gone alone. Thanks for the inspiration! I love watching your strength training workout videos! And, I love that you continue to inspire on so many different levels! Here’s to a strong 2019!